ERBIL (Kurdistan 24) – A joint statement by Syriac Christian organizations in Syria, Europe, and the US on Thursday demanded the establishment of a no-fly zone to stop a possible Turkish attack following an announced US withdrawal, fearing it could effectively end Christianity in northern and eastern Syria. Turkish senior officials have threatened that their military would cross the southern border to attack areas in Syria east of the Euphrates, both before and since the announcement of Trump’s decision in late December. A significant population of Christians lives in the territory that Turkey has said it will attack, now under the control of the Self-Administration in Northern and Eastern Syria (NES). The situation in Syria has been horrible. I have been praying for those affected in Syria for some time and again ask others to also do so. The post at COGwriter that he specifically referred to was Obama Administration considered to be a facilitator of ‘Christian’ persecution. 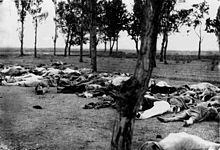 The Armenians have been distrustful of Turks for a long time and blame them for the Armenian holocaust of 1915. Such atrocities should not happen. Between civil war, chemical weapons, murders, deaths, and war crimes, it is terrible what the people in Syria, professors of Christ, Muslim, or otherwise have had to endure. They, along with all of us, need to pray “Thy kingdom come” (Matthew 6:10, KJV). This entry was posted on Saturday, February 2nd, 2019 at 4:00 pm	and is filed under Religious News.